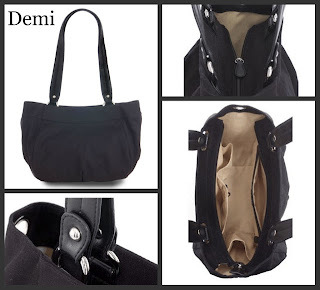 The Demi Base Bag is 7 (wide) x 14 (long) x 9.5 (tall). Handles pictured come with the bag and are 23 3/4 long and 7/8” wide, with an 11 3/4" handle drop. Interior features one zippered pocket, one small open pocket, two medium pockets, one cell phone pocket and two pen holders. Top zipper closure.